It is amazing to be in this ferry surrounded by runners. We all know that most of us will do the same exact trip in three weeks to go to the start of the NYC marathon. There is a very special energy in this boat. Today I will run with Nacho and Matt, Stefan is in Kona for his last Ironman of the season. We want to show him that his coaching has been efficient, we are super motivated. Although this race is “only” a half marathon, it is a very important day for me. I have been training a lot, running about 36 miles per week, I have no idea what I can do in a race by now. With Stefan’s advice, we decided to be aggressive. 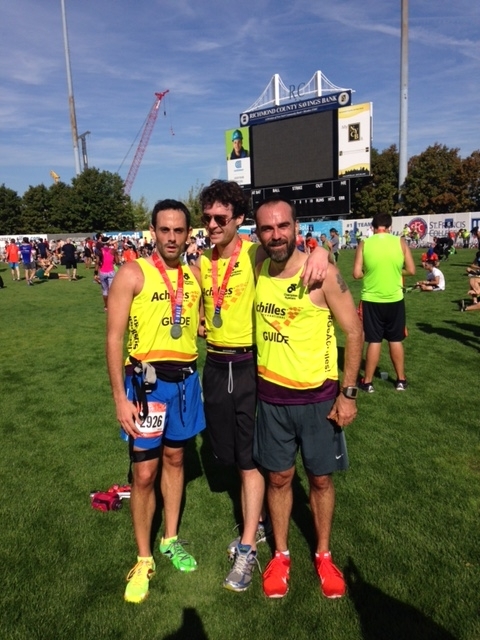 Our goal is a 1:40 finish, FYI, my PR is 1:43. So it should be tough! As we get off the ferry, I can tell that my guide, Matt, is walking with a certain sense of urgency. I’m guessing that he would like to go to the bathroom. We are in a bit of a rush, and as we were getting close to the porta-potty, a journalist from New York 1 asked us if we wanted to be interviewed. Well, you all know the size of my ego, so of course I said yes! I thought that this would be a 30 second thing, but it turned out to last 5 to 10 minutes, and when we were finally done it was too late for my poor Matt, so we started with a huge question mark in our mind. Sorry Matt! The Staten Island Half is quite a large race, there is about 8500 participants. A few Achilles athletes came with us, we all wear our neon yellow jerseys with a lot of pride! By the way, it was cool to meet some readers of this blog on the course, special shout out to Christine and Dieter! The first few miles of the half are “easy”, my main focus is too keep my heartrate between 157 and 165 BPM. Nacho and Matt are on their A game, they open the crowd for me like champions. Don’t forget that the road is narrow, and there are a lot of runners all around us! I feel very safe with them, quickly I close my eyes and try to get in the zone. As you probably guessed, the boardwalk is flat, this was indeed a good time, so we did accelerate, fortunately my heartrate remained below 165 BPM. I knew then that this would be a good race. But at mile 9, gosh, things become serious. We pass under the Verrazano bridge, and attacked the main difficulty of the course, a nice little incline, I can tell that everyone around me isn’t exactly smiling. My heartrate jumps to 178 BPM, I moan for the first time, but we get over it still holding a strong pace. The plan was to up our tempo after mile 10, my heartrate should then be around 175. So we switch gears, I can tell that my body isn’t happy, but what the hell, no one is asking for his opinion. “Charles, this is the last 5 K, you got this”. Certain moments stick with us after a race, this was definitely one of them. My breathing is getting a little out of control, I moan more than I would like to confess here, but I know that Stefan did the math well, I know that I should be able to sustain this pace. A last incline, oups, my heartrate is at 185 BPM for a sec, let’s ignore this and finish this race already! We are close to the baseball stadium, I can hear the crowd, the finish line is on homeplate, come on Charles, you can do this! It’s a fun finish, everyone is saying “go Achilles”, what a great moment. We placed 822nd out of 8500. I feel ready for the marathon, yep, today was a good day!